Alright, folks. We’re tackling a very adult topic today. It’s so grimy, you’ll need elbow grease. So dingy, you’ll need a mild soap. Today, we’re talking about how to protect your outdoor furniture. Many of us have never invested in outdoor furniture. And if we have, it hasn’t been the kind we’ve cared much about. But in the grown up land of “life beyond plastic resin patio sets,” a little TLC goes a long way. The amount of care that goes into protecting nice patio furniture is a nebulous fact that could do with some gentle expectations-setting. 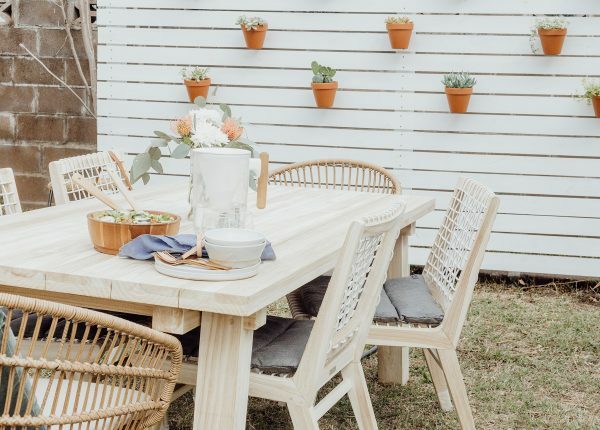 Hold the pressure washer and the bleach, we’ll walk you through how to protect your outdoor furniture so it will live a long comfy, stylish life. Different materials require different levels of care. 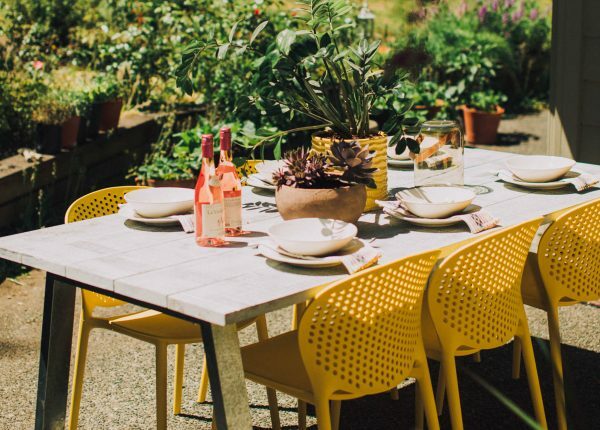 You might have anticipated this before purchasing, but if you find yourself asking how to protect your patio furniture, fear not. That’s why we’re here. Do use a soft, non-abrasive cloth. Don’t use a pressure washer. Always Rooney keeps her Teaka table and matching chairs looking super-fresh and clean — probably because she’s following these cleaning instructions. If you can care for a cactus, you can care for outdoor wood furniture. That said, some woods fare better than others in the outdoors. At Article, we use Teak and Acacia because they’re solid, hardy, and resilient. Teak is naturally dense and oily. The oil it produces is like a force field. Rain, cold, heat, and wind are no match for it. The oil seals the wood, repelling ravenous termites and invasive moisture alike. Acacia, when finished, has a similar resilience. The general cleaning instructions for wood furniture is pretty pedestrian. Wipe away dirt twice a year using a damp, non-abrasive cloth. For stubborn spots, simply dip a cloth into a mix of gentle dish soap and warm water. Wring out the excess liquid and wipe the spot. Then, dry the area with a second cloth. For mildew removal, apply the same concoction to the nastiness and gently scrub with a soft bristle brush. Of course, external factors force you to clean your furniture a little more often. If you position your wood furniture around a pool or hot tub, wipe it down with water once a week. As chlorine accumulates, it’ll gnaw away at the wood’s finish. Over time, all wooden furniture will show signs of aging. Teak and acacia develop a silver patina that, like George Clooney’s salt and pepper, just adds to its naughty charm. Clean up any dimples or smile lines with a wax filler or touch up pen. (We stock both in a range of tones). Modern, industrial, but please hold the rust. While typically easy to care for, some metals are susceptible to corrosion, oxidization, and scuff marks. At Article, we use powder-coated high-quality aluminum and hot-dipped, galvanized steel to combat such reactions. Contrary to what you’d imagine, cleaning steel and aluminum requires a delicate hand. A rag and some warm, soapy water does the trick. For mildew removal or an extra bit of shine, wipe your metal down with a 50/50 mix of vinegar and water. No need to be aggressive, a light wipe will do. Be sure to rinse the metal thoroughly and pat it dry. Leaving excess water or cleaning agents behind can result in stains and discoloration. The Foodess knows how to keep a clean kitchen… and clean patio furniture. Her Dot chairs sparkle in the sunlight (thanks to a little soap and water). 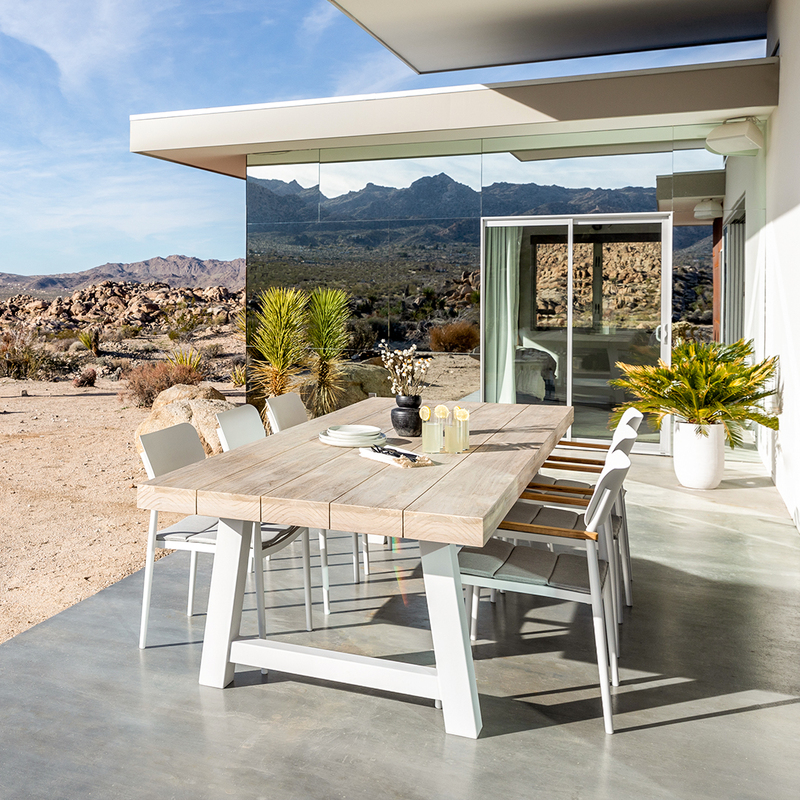 Plastic has the potential to be the outdoor living room’s stylish, colorful workhorse. But buyer beware: not all plastics are created equal. Plastic furniture can be durable, UV resistant, and crack-proof, but only if it’s very good quality. It’s all a question of how to protect your outdoor furniture. We use polypropylene to get all the aesthetic and functional benefits of plastic with none of the flimsy lame downsides. To keep colorful polypropylene furniture bright, move it out of the sunshine when you’re not using it. For day-to-day cleaning, all you need is dish soap diluted in a bath of warm water and a damp cloth. Skip the bleach. A sprinkle of baking soda on a wet sponge is abrasive enough to remove stains but gentle enough not to scratch the plastic. LemonThistle keeps her rattan Daisy chair looking top-shelf by keeping it clean and out of the rain. (Psst: we like her Urba sofa too!). 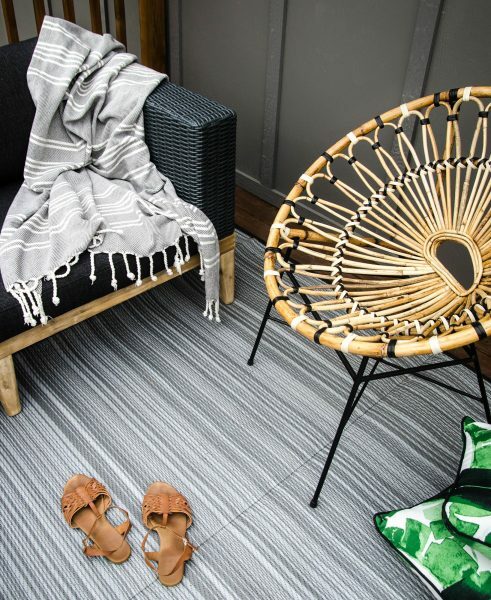 Like most beautiful, refined things, rattan is a little high-maintenance. You’ll hear rattan and wicker thrown around synonymously. But there’s a big difference. Wicker actually refers to the weaving technique —not the material— and different types of wicker require different types of care. At Article, we make most of our wicker furniture from rattan, a climbing vine found in tropical paradises. While robust enough for Tarzan to swing on, rattan is still susceptible to the elements, especially when left in its natural form. Exposure to water can cause rattan to swell. If you live in a rainy climate, store your rattan in a covered place to protect it. A gentle hand makes for clean, happy rattan. Use a soft cloth and warm water to wipe down your piece, but hold the soap. Avoid scrubbing and water saturation, even when challenging a stubborn smudge. Scrubbing could strip the material and expose its fleshy innards to water damage. Blot away excess moisture and allow the piece to air dry when you’ve finished. That moment when your sanctuary is so calm and chill, and then a frothy white dollop of poo drops from the sky and splatters all over your favorite throw pillow. From bird projectiles to UV rays to spilly guests, outdoor fabrics take a lot of abuse. The good news is, they’re made for this sh … stuff. Generally, acrylic fabrics like Sunbrella or solution-dyed yarns like Olefin cloak outdoor furniture. Resistant to stains, mildew, fading, and abrasions, these fabrics are capital T tough. We love how Alexandra of AVE Styles has styled her Tezra sectional. She even lets her dog Pete get a cuddle in on the couch — all the more reason for a brisk vacuum. Unless you enjoy sitting in a bug graveyard, you probably give your outdoor furniture a brush down on the regular. For anything that won’t dust off with a broom, bring out the big guns: your vacuum’s fabric attachment. It’s the small rectangular piece with soft bristles around the suction area often left to fester in our cleaning cabinets. Don’t forget the seams! Now, there are many types of fabrics you’ll encounter: throw pillows, outdoor cushions, and covers to name a few. You’ll find that you can remove most covers from their interior cushioning for easy washing. For washing, start the same way as you would a new shirt: check the care label for instructions. At Article, we recommend seeing a professional cleaner for most of our slipcovers. No need to cry over spilled wine. I mean, I do, but not because of the cleaning process. For spots, mom’s advice stands: always blot, never rub. Spray on a cleaning solution of water and mild soap. Let sit. Rinse away all soapy residue. If someone spills an oil-based liquid like salad dressing or suntan lotion, use a dusting of an absorbent like cornstarch to sop up the mess and remove it with a straight edge. Then, use a spray bottle to apply a mild cleaning solution mixed with water. Rise the fabric thoroughly, paying special care to clear all suds from the affected area. Leave it to air dry. Mildew: the true nemesis of outdoor furniture. Rain-soaked loungers and wet patio cushions make the perfect breeding ground for mildew, which thrives in humid and damp environments. On outdoor fabrics, mildew looks like a powdery plume of white, grey or yellow. In more severe cases, mildew turns brown or black… which means you are now dealing with mold. Spot some grossness? All is not lost. Depending on the severity, you can rid the fabric of mildew in a number of ways. Just be sure to work swiftly. If you leave mildew untreated, it gets unsightly, smelly, and potentially dangerous real fast. First things first, prep yourself and the fabric. Wear a mask to prevent mold spores from entering your lungs. For best results, begin brushing the mildew spots with a soft brush to loosen the its grip. Then apply one of the following cleaning solutions. So you went away for the weekend and forgot the cushions out in the rain. No need to bring out the lab coat. For light mildew removal, try a paste of lemon and salt, or a vinegar-based cleaner. To make a lemon paste, combine two tablespoons of lemon juice and one tablespoon of salt in a bowl. Dip a cloth into the mix, rub it over the mildew spots, and allow the mixture to sit for an hour. Then rinse it clean with water. For major league mildew, rid the stains with borax or bleach. (Not together, of course.) Use chemicals with caution and always consult your care label. To attend a stain with borax, mix 1/4 cup borax into one cup of hot water. Rub the solution over the mildew spots with a rag, allowing the solution to soak into the fabric. Wait an hour then rinse it with clean water. Only use a bleach solution if you’re one million percent certain your fabric is colorfast. Even then, do a spot test before proceeding. Dilute 1⁄2 cup of bleach into a gallon of water. Use a spray bottle to apply the mixture to the infected area. Don’t let the solution sit for too long. Lightly scrub the fabric until the mildew is gone, then rinse the cushion with water. After a few summers, you might notice some fabrics lose their water-repelling luster. To combat soggy material, treat your materials with fabric guard from your local hardware store. Batten down the umbrella! Secure the cushions! Cover the sofa! Move the whole thing inside! Freak hail storms happen. Like a good adult, it’s important to know the forecast so you can take the appropriate steps to protect your outdoor furniture. You wouldn’t leave your outdoor sofa outside in the rain. 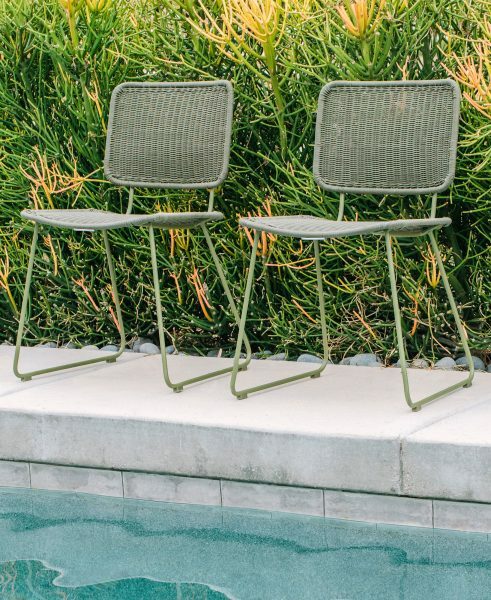 AVE Style’s Rumi dining chairs look great poolside — but she knows to move them under cover when they’re not in use. Furniture covers are a good frontline. Typically made of canvas, polyester, or vinyl, they ain’t pretty. But they’ll shield your furniture in the most blustering of storms. The best defence is a strong offence, so consider applying a protective coating. Buff aluminum and plastic furniture with a little car wax to make it look shiny and new. Apply a coat of finish or varnish to wicker and wood. Spray a silicone sealant or protective paint to iron to prevent rust from forming. Not only will a protectant make your furniture sparkle, but it’ll add summers to its lifespan. Then, there’s always storage. Outdoor storage doesn’t have to mean a large plastic bin that haunts a corner of your otherwise HGTV-ready exterior. Storage can become a part of the aesthetic. 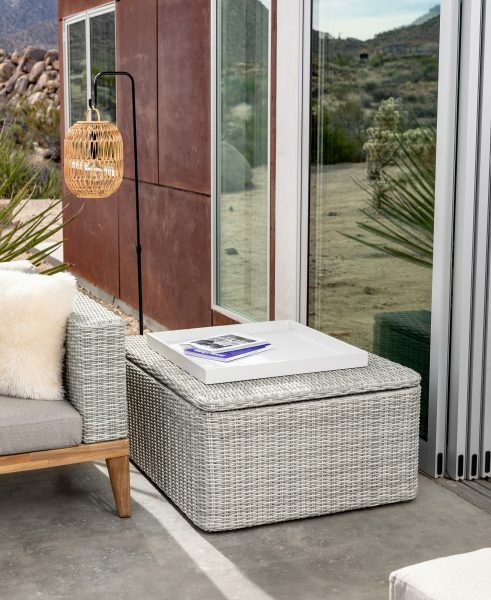 Take our ORA storage coffee table. While adorable and delicate looking, this trojan horse is ready to battle Mother Nature. Made of waterproof, synthetic wicker and lined with polyester fabric, your throw pillows, blankets, and lights are safe here. When fall threatens, it’s tempting to stuff your summer things away and prep a pumpkin spice. In with the new!!! But remember: the condition you store your patio furniture in will be the condition in which you come upon it. Parting is such sweet sorrow. So is nine months worth of dust, spider eggs, and other basement build-up. The Ora coffee table doubles as sneaky storage. Made from weather-proofed wicker and lined with polyester, the Ora helps keep your blankets dry and your coffee cup steady. Before bidding your furniture adieu, give it a good wipe down using the basic cleaning instructions we’ve provided. Protect materials with the appropriate sealants. Make sure everything is completely, 150%, without-a-doubt dry before you put it away. Store your furniture carefully so it looks as good coming out as it did going in. This takes a bit more thought that you’d think it would. If housing fabrics and cushions in plastic bags was your first thought (like it was mine), think again. Plastic bags are a hotbed for mildew. Use cloth bags instead so the fabric can breathe. Repeat after me: Cool and dry. Cool. And dry. This is your mantra for any furniture storage. The biggest storage battle you’ll face is humidity and moisture. If you’re lucky enough to own a patio and a garage (wow, blessed), lay down a plastic sheet to prevent moisture from effecting your furniture. Something is better than nothing, so if you’re in a pinch, even a layer of cardboard will do. Then, elevate your furniture off the floor with wood pallets or cinder blocks to prevent water damage. Finally, throw a drop cloth over top to keep everything dust-free. Of course, if you have furniture covers, just use those. Outdoor furniture is durable, not indestructible. 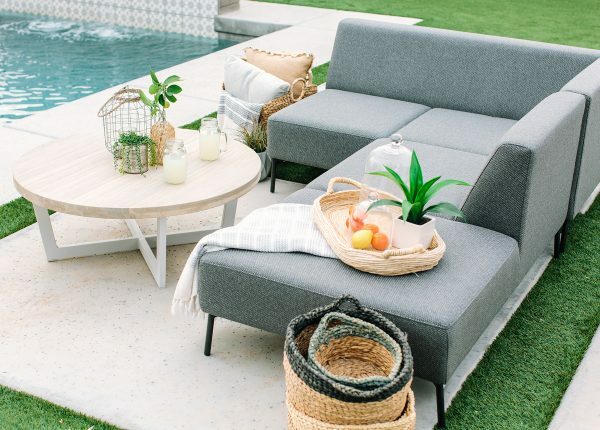 With minimal effort and a little tender care, your outdoor living room will be cocktail, lounge, or party ready for summers on end, no matter what the weather brings.